The title Star Trek Into Darkness remains just as nebulous by the time the closing credits roll as it does during a chase prologue along the Class M Planet of Nibiru. Fortunately, director J.J. Abrams—who helmed the well-received 2009 reprise—inadvertently provides a number of alternate titles along the way. Into Darkness is the second installment of Star Trek’s look into yesteryear, the continuation of an alternate timeline created in Abrams’ previous film that chronicles the adventures of the fledgling crew of the Starship Enterprise. Just call it Star Trek Babies II. 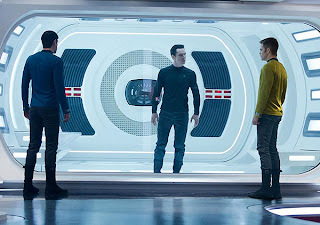 In essence, Into Darkness is really about the evolving relationship between Captain Jim Kirk (Chris Pine) and Spock (Zachary Quinto), although their bromance usually boils down to scenes like Kirk’s misty separation anxiety at the news that Spock is being reassigned to another ship, or Spock’s jealousy emotion being triggered when Kirk enlists the duplicative services of a beautiful, blond science officer (Alice Eve). What hampers any emotional heft, however, is the misapprehension that their relationship has always been about the characters, discounting the time-tested rapport developed between William Shatner and Leonard Nimoy. That said, Pine and especially Quinto prove capable as Kirk, Spock, a more prominently featured Uhura (Zoe Saldana) and the rest of the crew face a threat from within. Starfleet officer-turned-terrorist John Harrison (Benedict Cumberbatch) is a highly intelligent super soldier whose covert design goes sideways after he breaks loose from the moorings of his Federation minders. Just call it Star Trek: The Wrath of Bourne. Early on, Abrams hints at Star Trek’s longstanding political and social awareness with allegory critical of the current war on terror, including policies favoring indiscriminate hits on high-value targets and drone missile attacks. [Poor Klingons, formerly representative of the threat and decay of the Soviet Empire, are now stand-ins for Middle Eastern terrorists.] But any such high mindedness quickly evaporates in the fog of a script that is equally light-hearted and incomprehensible, along with a hellfire of 3D special effects and Abrams’ trademarks visual quirks. Just call it Star Trek: Into Lens Flares. Unlike the sublime mix of rediscovery and homage that fueled the 2009 reboot, Into Darkness eventually chokes on the umbilical cord tethered to its parental heritage. Trouble with a Tribble or one of a dozen “manual auxiliary rerouted power couplings” are cute enough. But homage soon crosses the line into unoriginality, from the choice of villain to the mashed-up tropes to a scene in the final act featuring such shameless aping that it converts the sacrosanct into self-parody. Into Darkness is an entertaining retread that also feels like an elongated TV episode with a bigger budget and explosions that come at the expense of the series’ humanism. This next generation Star Trek is reworked and replicated for today’s generation of moviegoers. Just call it Star Trek: Attack of the Clones.